Oliver Wilson hopes a return to Scotland can help provide the inspiration to start climbing the leaderboards again. The Englishman, who represented Europe in the 2008 Ryder Cup, enjoyed the greatest moment of his career by winning the Alfred Dunhill Links Championship at St Andrews two years ago. Wilson’s triumph was completely unexpected. He had lost his European Tour card and was playing on the second tier Challenge Tour at the time. 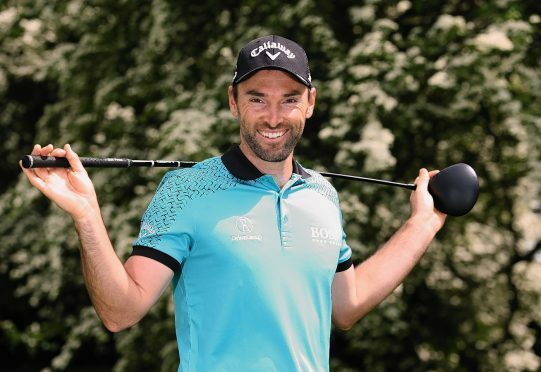 But he made the most of a sponsor’s invite to claim first prize, finishing a shot ahead of Rory McIlroy, Aberdeen’s Richie Ramsay and Tommy Fleetwood. The victory earned him a two-year exemption to compete on the tour. But since that magical moment, Wilson has struggled to build on his success. He said: “I still think about that event quite often. I have a lot of good memories from that week and those are the good memories I can call on in the years ahead if things are not going right for me on the course. “A lot of good stuff happened to me during the week of the Dunhill Links and I am trying to get back to something like that. “I think I am actually probably a better player than I was then. But I am not really putting it all together at the moment which can lead to frustrations of their own when I am not getting the results I think I should be. Wilson believes Castle Stuart Golf Links provides the perfect test for the European Tour’s elite players ahead of the following week’s Open championship at Royal Troon. He added: “You can’t please everyone. Some people want a week off before the Open, other people want to play a tournament. “In my opinion, the Scottish Open is a great tournament in its own right. To get the best field organisers have to think about the Open as well and having the Scottish Open on a links courses helps strengthen the event. “I love playing links golf in Scotland. When the weather is nice, it is one of the best places in the world to play. “Castle Stuart is a course I really like. I was a big advocate of the Scottish Open going there because I think it is a generous links course. It is a little bit more stress-free and not as brutal as a course such as Turnberry. “It is not going to ruin the players before the Open. It is a course that allows players to practice and get into links mentality without being too stressful. “It is a little bit more generous off the tees and it gets players in the right mindset.